ICWS offers Undergraduate and Postgraduate Pathways leading to a degree award from Swansea University. Pathways can incorporate both Academic and English Language Studies and can be tailored to the specific needs of each applicant. One of UK’s most prestigious universities: Swansea University has an ongoing reputation as one of the UK’s leading universities, thanks to its high quality teaching that is driven by world-class research. Smaller classes with personalised attention: ICWS has a personalised and supportive educational philosophy that encourages students to reach their maximum academic potential. Flexible entry: ICWS’s flexible entry system of September, November, January, May and June intakes enables you to start your studies at the time best suited to you. 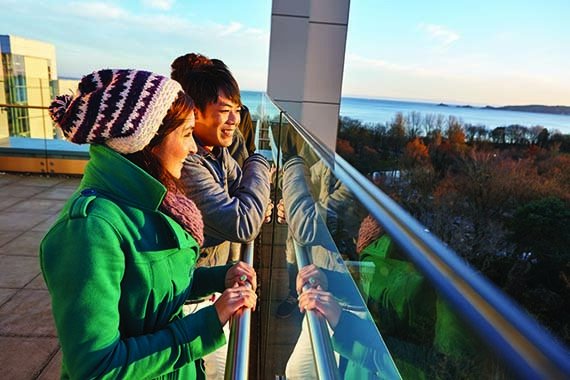 Campus location: ICWS is located on the stunning parkland seafront campus of Swansea University overlooking Swansea Bay and the Gower Peninsula-the first place to be designated as an Area of Outstanding Natural Beauty (AONB), however some teaching is delivered on the new bay campus. Fantastic accommodation options-click here to find out more information.